Federal Appeals Court Says Arkansas Can Block Medicaid Payments To Planned Parenthood : The Two-Way It reversed earlier injunctions that forbade the state from suspending payments to the medical provider over a controversial leaked video of Planned Parenthood staff. Arkansas Gov. Asa Hutchinson, pictured here during an interview last month, ended the state's Medicaid contract with Planned Parenthood two years ago. He praised the circuit court's decision. A federal appeals court has sided with the state of Arkansas against Planned Parenthood, saying it can block Medicaid payments to the medical provider. It reversed earlier injunctions that forbade the state from suspending the money in the wake of a controversial leaked video of Planned Parenthood staff. That video, leaked by anti-abortion activists, purports to show Planned Parenthood staff outside Arkansas discussing fetal tissue sales. Planned Parenthood has said the tapes are fraudulent and multiple investigations have deemed the allegations as false. 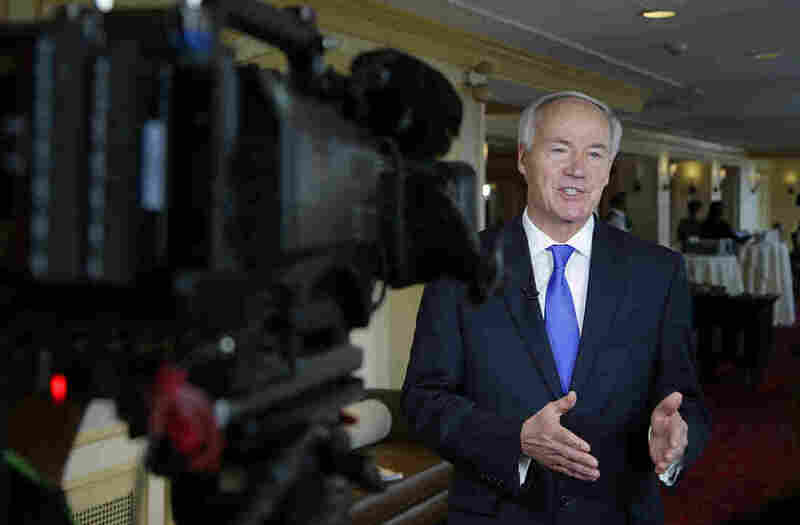 In 2015, citing the video, Arkansas Gov. Asa Hutchinson terminated the state's Medicaid provider agreements with Planned Parenthood's local affiliate. Then, three unnamed Planned Parenthood patients sued the director of the Arkansas Department of Human Services, saying that it was violating their federal right to choose any qualified provider offering the services they were seeking. A district court then blocked the state from cutting off payments to Planned Parenthood for these three patients. A second injunction expanded that to an entire class of Medicaid beneficiaries in Arkansas who used Planned Parenthood services. Today, in a 2-1 decision, the U.S. Court of Appeals for the Eighth Circuit vacated those injunctions. U.S. Circuit Judge Steven Colloton wrote that in the provision of the Medicaid Act cited by the plaintiffs, it is not clear that Congress intended to create a judicially-enforceable right for individual patients to choose any qualified provider that offers the services they seek. He said that it would create a "curious system" to review a provider's qualifications. "Under the Jane Does' vision, while the provider is litigating its qualifications in the state courts, or after the provider unsuccessfully appeals a determination that it is not qualified, individual patients separately could litigate or relitigate the qualifications of the provider in federal court," Colloton wrote. At the same time, Colloton says "the lack of a judicially enforceable federal right for Medicaid patients does not mean that state officials have unfettered authority to terminate providers," and notes that providers whose contracts are cancelled have the right to appeal. In a dissenting opinion, Circuit Judge Michael Melloy notes that four other circuit courts and numerous district courts have ruled the opposite way, finding that there is a "private right of enforcement" to choose any qualified provider, such as Planned Parenthood. The decision does not comment on the video as the rationale that Hutchinson provided for seeking to end the contract. Planned Parenthood says it is "evaluating all options to ensure our patients receive uninterrupted care." "This is not over," said Planned Parenthood Federation of America Chief Medical Officer Raegan McDonald-Mosley. "We will do everything in our power to protect our patients' access to birth control, cancer screenings, and other lifesaving care. Extreme politicians are trying to defund and shut down Planned Parenthood — and this is not what Americans want." In a statement, Hutchinson described this as "a substantial legal victory for the right of the state to determine whether Medicaid providers are acting in accordance with best practices and affirms the prerogative of the state to make reasoned judgments on the Medicaid program." Jerry Cox, the executive director of the Family Council, an Arkansas-based conservative group, tells KUAR's Michael Hibblen: "The videos aside, the question is should the state of Arkansas do business with an organization that aborts babies when they don't need to." According to The Associated Press, "the state has said Planned Parenthood received $51,000 in Medicaid funds in the fiscal year before Hutchinson's decision to terminate the contract," and "none of the money paid for abortions."